8 Universal USB ports (8.6A total) auto-adjust charging rate for all of your tablets, smart phones, & digital cameras. Yubi Power products are manufactured with the highest standards of quality and safety in mind. We only use premium quality circuitry in order to provide safe and efficient charging. 4 Charge Squares for a total of 8 individual Universal USB ports, allowing you to consolidate all your charging needs into one safe and reliable charging tower station. Allows you to simultaneously charge 8 different USB 1A devices or 4 different USB 2A devices at once. 8 surge-protected outlets with 6-foot power cord, perfect for your home or office. To charge 2.0A device or greater (i.e Ipad) please utilize only 1 of 2 available USB ports per charge square. 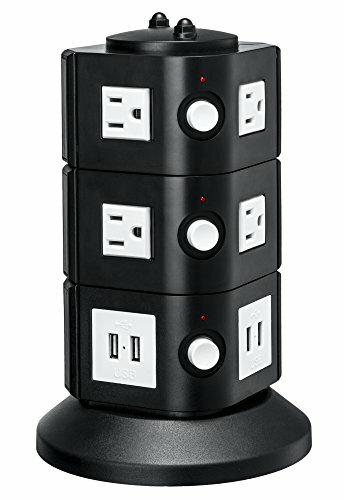 Yubi Power 8 Port Universal USB Family Charging Tower Station w/ Surge & Overload Protection for Iphone, Ipad, Android Devices, Samsung, Digital Cameras, Mp3 Players, or Any Usb-charged Device. Yubi Power 16 Port Universal USB Family Charging Tower Station w/ Surge & Overload Protection for Iphone, Ipad, Android Devices, Samsung, Digital Cameras, Mp3 Players, or Any Usb-charged Device.